I had my best Genius playlist yet they other night. Once again, "The Lotus Eater" makes an appearance, but I'm not complaining. "Demigod" and "Stabwound" tend to show up a lot too, it seems. This time, the playlist is based on Gojira's "Vacuity," from the excellent The Way of All Flesh . Yes, lately I have gone out of my way to find Japanese metal. Sigh is probably the most well-known Rising Sun band among extreme metal circles, and for good reason: They are both uncompromising and experimental. Their latest, Scenes From Hell , is the first to include new member Dr. Mikannibal, saxophonist, vocalist, and thinly veiled attempt to appeal to male hormones. The album makes good use of the saxophone, though, and also includes a full horn section. This doesn't detract from the metal, but instead it seems to transform it from ordinary black metal into a demonic war march. The brass instruments evoke both militaristic and ecclesiastical feelings, putting them into a very dark context, but they also often stray into Latin horn territory for a very strange juxtaposition. The other thing that really makes Sigh stand out on this album is the guitar solos. Instead of doing thrash or black metal style solos, they seem pulled from old school heavy metal or hard rock albums, providing another interesting contrast. Aside from the brass and the guitar solos, this is pure black metal. If it wasn't, then you wouldn't be able to recognize it as such. What I don't understand, though, is that with all of their innovation, they have still stuck with the lo-fi, poor recording favored by some black metal purists (who ironically profess anti-conformist beliefs while enforcing a definition of black metal which is extremely limiting and, therefore, conformist). The music is awesome, and I'd be willing to bet these guys can kill in a live show, but the recording is terrible. And I'm no audiophile, either, but please just don't make it sound like you recorded it in a parking garage. The Verdict: The music is awesome, and it's innovative, but the recording is terrible. If you turn the stereo way up, and then walk into the next room, it will probably sound natural, and in that situation it may be one of the best you hear all year. I give it 4 out of 5 stars. I read about Van Canto in the June Decibel, and I had to look it up. They are an a capella metal band. Yes, you read that right. Except for drums, they have five vocalists, and that's it. Through vocals, they replicate the sounds of guitar and bass, and they do an impressive job of it. It really is amazing, but it's just a curiosity. I can't imagine anyone actually enjoying a full album of this stuff, and I just barely made it through their cover of "Master of Puppets". But as impressive as it is, it's equally laughable. It's hard to believe they're even serious about it, but it appears they are--it even seems Nuclear Blast is taking it seriously. There's no way I would get this to do a proper review--I don't think I could even listen to it the whole way through, let alone spend money on it--but it's worth mentioning here for humor value. After returning the Sony noise canceling headphones, I got some Auvio headphones at Radio Shack. They're not on Amazon, and I can't find them on Radio Shack's site either, so I can't tell you exactly what model they were or find a picture for you. But they cost $40 and have a circum-aural design (they are supposed to go around your ears). They have good sound, definitely. They are also the best sound-isolating headphones I tried (aside from the oh-so-expensive Bose ones I briefly tried on at Best Buy). Like many headphones sold as circum-aural, they don't actually go around your ears, though. They cover most of your ears. This, coupled with the fact that they are very heavy and tight, made them extremely uncomfortable. After dozens of little adjustments, I got them into a position where I could wear them about 45 minutes before it got really bad. After a little more than an hour, they started to get a little hot, too. The cord was also a strange length. It wasn't terribly long, but it was long enough that I had to stuff some of it in my pocket. But it wasn't long enough to use with a stereo, so I have no idea why they made it the length they did. Also, they were too bulky to comfortably fit around your neck when not in use. The Verdict: I think for someone who doesn't wear glasses, these might just work. For me, they didn't. I give them 2 out of 5 stars. Just about anyone into metal has heard about the Iraqi thrash metal band Acrassicauda (Arabic: اكراسكودا). They were the subject of the 2007 documentary Heavy Metal in Baghdad. The story of their struggle to play the music they love in a society which neither understands nor tolerates it, and in a society torn apart by war, has become a legend. It resonates with us more than Cliff Burton's death and it's more memorable than Ozzy at the Alamo. The documentary itself ran into enough problems, so the end product was not all that high quality, despite the compelling tale told. It ends with the band having recorded a demo and giving it to the film's producers to distribute, and the band members stuck in the Purgatory of being illegal Iraqi immigrants in Syria. The story's happy ending (or new beginning, rather) is that the band members obtained refugee status in the US and released their first EP nine years after their formation. Only the Dead See the End of the War contains four songs, and is about 21 minutes long. The question you may be asking: Are they any good, or are they just a good story? My answer is, They are definitely good. Their influence from early Metallica is obvious, and their relative isolation from the metal scenes of the world makes them sort of a throwback ("Garden of Stones" sounds a lot like Death , for instance). The resulting sound is surprisingly a stripped-down version of Alchemist , and at times they even incorporate some Middle Eastern influence into their music. The songs are well-written, and their obvious love of metal is readily apparent. It is lacking in polish, but that's what you would expect of any debut EP. The Verdict: Maybe I'm being slightly generous here because this is only a debut EP, but I think it's very good, and these guys are definitely a band to watch out for. I don't think they'll ever be revolutionary in metal music, but they'll be a reliable standard. I give it 3.5 out of 5 stars. I recently said I never realized how big a fan of gothic metal I apparently am. I have always known, though, that I am a huge fan of industrial metal--at least most of the time. Enter the Italian group Ensoph, an industrial gothic metal band, with some black metal elements. I currently own two of their albums, their 2004 sophomore release Opus Dementiae and their latest, 2009's Rex Mundi X-ile . They have a highly unusual sound, so it's very difficult to give you any comparisons to other groups--they could even qualify as avant-garde metal. The music seems to be a backdrop of gothic metal overlaid with a lot of industrial elements, such as synthesizers. Vocally, there are two voices present, a standard goth metal clean vocal style and a strained black metal rasp; I don't know whether it is from one or two vocalists. On the 2004 album, there seems to also be some folk metal (a flute or similar sound) poking in as well. One common problem with industrial metal is that the metal part of it can be overpowered by the atmospheric elements. This is the case on Opus Dementiae. As a result, the songs come off as unfocused, and can easily lose your attention. However, on Rex Mundi X-ile, Ensoph seems to have gotten the industrial elements under control, and have written some focused songs which are most definitely metal--a completely unique brand of metal worth checking out for fans of industrial, gothic, avant-garde, or black metal. They also did a very interesting cover of Alice In Chains's "Would?" The Verdict: They're too unknown to even have a Wikipedia page yet, but because of their unique sound and definite improvement in more recent work, you may be hearing more about them in the future. I give Opus Dementiae 3 of 5 stars, and Rex Mundi X-ile 4 of 5 stars. What is there to say about a new Dark Tranquility album? In the late 80's they were one of the first groups to develop the melodic death metal style, building aggressive songs around compelling melodies, and accenting it with subtle keyboards. Since at least the mid-90's, they've been one of the most consistent metal bands out there in both style and songwriting. We Are the Void is no exception. Saying that it's consistent is not the same as saying it's more of the same. Their songs are always new, and they're always willing to plug in subtle elements from other genres, be it black metal (the vocals lean this way), gothic metal (see "Her Silent Language"), thrash metal (see "In My Absence"), sometimes even industrial metal (the keyboards). The Verdict: So, what is there to say about a new Dark Tranquility album? Nothing. You should already have it, because it's predictably good--but the songwriting is not predictable. I give it 4 out of 5 stars. If a black metal band had toured arenas with the likes of Kansas or Genesis in the 70's, that band would have sounded like Borknagar's Universal . With their huge dramatic sound, catchy choruses, and prominent electric organ, it wouldn't have been too out of place on my dad's 8-track player. The sound is highly melodic, and has all the infectious drama of those much-loved-and-maligned 70's classic rock bands. Clean vocals take precedence over growls and electric organ over guitar, and there are softer sections to every track. The sound is definitely progressive, but at every turn they clearly put memorable songwriting before showing off. The production is top-notch as well, with every instrument audible at all times. With the extensive use of keyboards (especially on "Fleshflower") it doesn't fit most people's expectations of a metal band. Every instrument does get a chance to shine, though, including the bass and drums, and they still manage an all-out assault on tracks like "Havoc" and parts of "Worldwide". The clean vocals are a bit nasally (not unlike Mastodon ), so not everyone will like them (the inclusion of former vocalist ICS Vortex on closer "My Domain" makes the vocals seem worse by comparison). I happen to like the vocals as well as the keyboard. The electric organ is a vastly under-used instrument in metal, but it's seeing a surge in popularity with groups like Opeth and Cathedral using it. The only real complaint I have is the most amorphous one possible: Even though nearly all the tracks are great, and the sound is consistent, it doesn't feel like a cohesive album. It's an inexplicable complaint, but there it is. One improvement would have been to make "My Domain" a bonus track instead of "Coalition of the Elements" and "Loci" (the latter makes a much better closer), but this wouldn't completely fix the issue. The Verdict: Though I'm not familiar with their earlier work, it gave me the distinct impression of an accomplished metal band's foray into more accessible material. Like Soilwork's Sworn To a Great Divide or Metallica's self-titled album , it will be divisive among metal fans, but provide an easy starting point to the band's catalog. I know I'll be exploring their earlier work. I give it 4.5 out of 5 stars. Today is my son Lincoln's third birthday. We had his party yesterday. We made the invitations together. Using blank cards, I drew robots on them and he colored them. The party had a robot theme. I designed the cake, and my mom built a robot out of his wrapped presents. Metallattorney introduced me to Skeletonwitch, a band from Athens, Ohio, USA with an unapologetically old school extreme metal approach to things. I picked up their 2007 sophomore release Beyond the Permafrost. Like many albums I've reviewed, these guys are a little tough to really pin down in terms of genre. Many have called them a melodic death / thrash metal band, drawing apt comparisons to At the Gates's classic Slaughter of the Soul . While this is a good description, I think it's more fitting to call them a thrash metal band with some death metal influences (the latter mostly confined to the vocals and drums). The sound, to me, seems about two parts Dark Angel's Time Does Not Heal with one part Death's Leprosy . The songs are compact, mostly hovering around three minutes in length, and largely they don't go under 99 miles an hour. Because of the speed and economy of the arrangements, and the generous helping of guitar solos, there is not a dull moment on the album. Like other practitioners of retro metal (such as The Sword ), they have also injected the retro flavor into the way they recorded the songs, for good or ill. The performances are extremely raw, retaining the energy and brutality of of a live recording--something which can be lost if you insist on a note-perfect mix. There is also a sense that they are using vintage equipment, either in their amps or recording equipment. The Verdict: Skeletonwitch perfectly captures the metal attitude of two decades past, from their name to their album art to their music, but does so without merely rehashing what's been done before. It does lack a little polish, though. I wish they could have managed to get note-perfect recordings while still retaining the high energy level; others have managed to do it. I give it 4 out of 5 stars. After writing this, I went back to reread MetallAttorney's review, and am surprised by how similar my take is. After getting fed up with the garrulous people at work, I asked for some better headphones for work as a birthday present. I got the Sony MDRNC7 Noise Canceling headphones. (I'm definitely noticing a Sony theme to this series.) The sound quality is about the same as the studio monitor headphones, and they are slightly more comfortable. Powered by a AAA battery on one of the headphones, and using a microphone to detect outside noise, they emit sound waves designed to cancel out any environmental noise. This sounds like a great idea. However, I tested them. They seem to work OK for ambient noise like a fan, but they don't do anything to block conversation noise. They therefore didn't do me any good. Also, when you turn the noise canceling on, it creates its own ambient noise, a kind of very faint hiss. It's enough to get annoying. Also, like the studio monitor headphones, it has a very long cord, which is very annoying when you're using it with a portable device--which is precisely what these are made for (they are sold to be used while flying). The Verdict: They have extras which make them cost more but don't do me any good, and the design is somewhat ill-conceived. I give them 2 out of 5 stars. I never realized I was such a fan of gothic metal, but it does seem like I've been reviewing a lot of it lately. Norwegian group Theatre of Tragedy have had an unusual evolution in their sound. The only consistent element in their 15 year career is the combination of male and female vocals. For their first three albums during the 90's, they were a promising gothic metal band, doing their lyrics in Middle English. The last of this era, Aégis , saw the group ditching the "beast" element of their beauty and the beast vocals in favor of a more muted, clean vocal style by the male vocalist. In 2000 , they made an abrupt shift to industrial rock / electropop with modern English lyrics, almost sounding like Madonna with an edge. They would continue this style for one more full-length, and then switch back to gothic metal on 2006's Storm (an excellent album), although keeping some of the energy and melody of their industrial era. On their latest, Forever Is the World, they have stuck with the gothic metal. Sadly, they have ditched the lessons they learned in their industrial era in favor of essentially replicating 1998's Aégis. The Verdict: Like Aégis, this album probably will not appeal to your average metal fan. Ever since that album, they've barely qualified as metal (or maybe not at all). Gothic rock fans will be a much more ready audience. It is still good, owing mainly to the female vocals, but not great. I give it 3 out of 5 stars. Sometimes it's tough to decide exactly which genre label you should apply to a particular group. Everything I've read says Finnish group V for Violence is a thrash metal band. If you listen critically to their debut The Cult of V, you'll realize they're not really thrash metal, but instead groove metal, or possibly alternative metal (I've never put much stock in the latter label, as I don't really understand what it means), with heavy influence from nu metal. Of course, it's easy to understand the confusion. All of those genres are almost exclusively American--not Finnish--and almost universally loathed by the European metal scene. The geo-cultural origins of a band can often get them lumped into the wrong genre (see Alice In Chains ). But V for Violence really sounds like an American group, from their name which doesn't make sense outside the English language, to their sound, to their image, to their liberal use of profanity (most European groups use little, if any). As I said, their sound is heavily influenced by nu metal, particularly Slipknot and Powerman 5000 . For some people, this is going to be a big turnoff; for others, it may lend some credibility to nu metal. Don't let the nu metal talk scare you too much, though. They are solidly on groove/thrash ground here, but draw influence from the much-maligned style. The Verdict: Comparisons aside, their writing is original yet consistent, and they perform with energy and charisma. The music is interesting, and the album seems to be about the right length, though most of the tracks aren't really going to floor anyone. Unless you're rabidly anti-nu metal, there's a good chance you'll like this, even if you don't love it. Though I've said nu metal is dead many times, it seems they have used strong nu metal influences for a new take on groove metal. I give it 3 out of 5 stars. 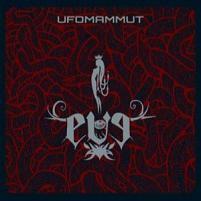 A lot of people have characterized Ufomammut as stoner doom metal. I don't know what they're smoking (but I can guess). This is definitely post-metal, so I'm sticking with that theme for a second review in a row. Their style is firmly rooted in the sludge metal that spawned the genre in the first place, sounding much more like Neurosis than Pelican . They use caveman vocals similar to those of Neurosis or Isis , but sparingly. On Eve, the Italian group has taken post-metal to its logical extreme by offering up a single 45 minute song. They've divided it into five movements, designated by Roman numerals. The only way to really describe this is to go track by track. "I" is mostly just buildup, but really gets interesting just before the 11 minute mark. "II" begins like the music from a slasher movie--it could have been composed by John Carpenter . A very nice bass melody comes about the 5 minute mark, and it picks up the pace around the 7 minute mark. "III" and "IV" are much more immediate (clocking in at 3 and 4 minutes, respectively). The former has a very heavy groove and some sci-fi sound effects, and the latter is much more bass-driven, though it does have a very cool guitar solo. Finally, "V" starts out with more sci-fi sounds (a little like what you might find on a Foreigner song), gets really cool around the 2:45 mark, and changes up about 4:45. They introduce a new rhythm about 6:20, speed it up a minute later, and finally end with some more horror movie music in the background. It really ends on a whimper instead of a roar, and this is perhaps the only real disappointment along the way. The ending is a hell of a bad place to disappoint, though. The Verdict: Like I said, it takes post-metal to the logical extreme; if you like post-metal, there's a good chance you'll like it. But by focusing on only a handful of musical themes for this long, others will say they jumped the post-metal shark. It's good, but not great, and I give it 3 out of 5 stars. A stronger finish would have improved it significantly. Dio was of course the second vocalist for Black Sabbath, including on the amazing Heaven and Hell , and also the vocalist of Rainbow and a respected solo artist (see Holy Diver ). 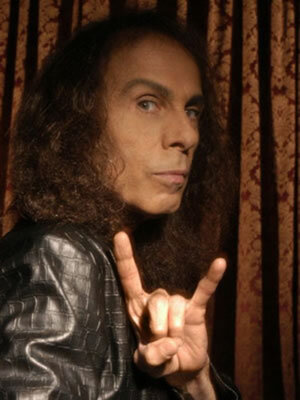 Dio is credited with popularizing the horns (as you can see in the picture). He died this morning after a six month battle with stomach cancer. This is the second amazing metal frontman to die in just over a month, as Peter Steele of Type O Negative died April 14. Any group with a few instruments and an artistic bent--whether genuinely artistic or merely a pretension to it--can perform post-metal. And not many people genuinely get it, either, so someone without any talent for the genre can probably fool a lot of people into thinking they've made some brilliant music; it's sort of like the emperor's new clothes. Instrumental post-metal group Russian Circles has gotten a lot of praise for this album, due to their restraint, and their ability to let the songs grow organically rather than to force it or rush through the song. But restraint and organic growth are what make it post-metal in the first place. It's not what makes it good post-metal. So, what makes for good music in the genre, and did Russian Circles achieve that here? Good post-metal must come in the form of a good album; unlike other genres, a single song won't do it. The album has to be built like a novel. A good novel has somewhere that it's going, and it has a number of conflicts along the way. Each song is the building up and resolution of a minor conflict, but each of the songs must fit together into a whole. Any good album, whether post-metal or any other genre, must follow this pattern. What makes it post-metal is the way the story is told. Most music is comparable to a plot-driven story: it gets where it's going as quickly as it can. Post-metal, on the other hand, should be like a good, character-driven novel. The themes present in the music are like the characters; they interact and develop naturally, and this is the nature of the conflict, its climax, and resolution. The greatest group in the genre, Isis , knows how to do this. They know where they want to go with the song, and, like any good author, they know how to carefully construct the elements that will naturally get to that point, in due time, without cheating the listener out of the suspense. On Geneva, Russian Circles shows a good understanding of the fact that the music has to develop naturally. However, where it's lacking is that they sometimes don't seem to know where they're going with the songs, and, as a result, they don't get anywhere. The effect is something like listening to a band that's played for a long time together doing an improvised jam session. About half the songs work, but the only ones that work well are the album opener and the title track. However, these are the first two songs. You don't put the whole story in the first two chapters. There is another problem as well. The album seems to be mostly post-rock, and only ventures into post-metal territory a few times. This is something else Isis has no problem with. I don't mean to say that the whole thing is terrible, though, so don't take this review the wrong way. It works, some of the time. But post-metal can only work really well if the entire album works, and this one has some definite low points, especially the dismal "Hexed All." The Verdict: Russian Circles shows some ability on their third album, because it works at times. People who can't get enough of Pelican will probably enjoy it. But if you're not really crazy about post-metal, stick with better groups like Isis, Intronaut , or Neurosis . I give it 2 out of 5 stars. It was about like reading a Robert Heinlen novel. It started out strong, and had some highlights along the way, but there were times that I just wanted to put it down. Send me an e-mail at kelly [dot] hoffart [at] gmail [dot] com for music submissions. Kelly Hoffart: Metal by nature. Lawyer by education. Bureaucrat by profession. Family man by powerful forces. All opinions expressed herein are solely my own, and do not reflect the opinions of my current or former employers, or any other person or entity with which I am or have been affiliated. Nothing in this blog is intended as legal advice, and does not create an attorney-client relationship. All legal discussions are strictly informative, not advisory, and accuracy of the information is not subject to any warranty, express or implied. If you choose to rely on such information, you do so completely at your own risk. If you believe you may have a legal issue, an attorney licensed in your jurisdiction can provide legal advice which will take into account your own unique circumstances and the applicable law.